I’ve decided that this dog-eat-dog life isn’t for me. (What a disgusting idiom – who came up with that one)? Life should be simple. Life should be fun. Less complicated and stress-free. So, I’m thinking…..how about living on a boat. Roughing it. 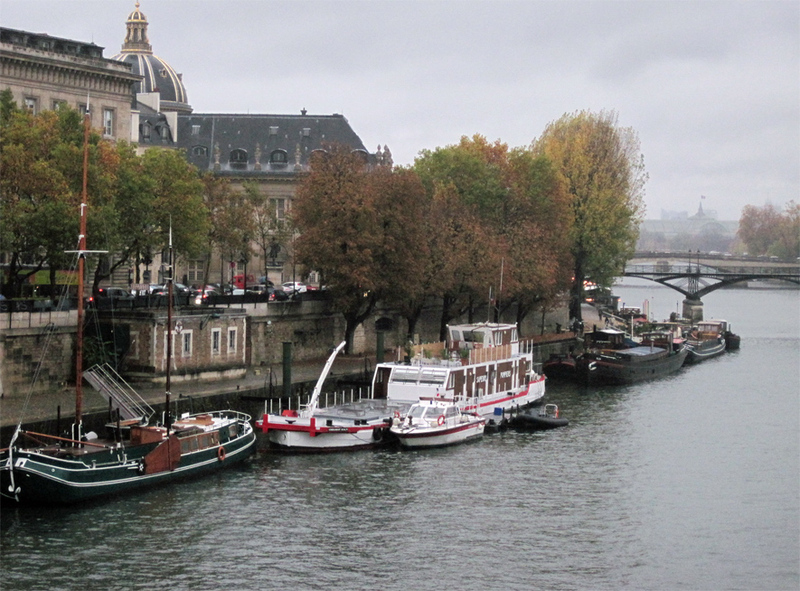 Just off the top of my head - the Seine would be nice. That would be pretty simple wouldn’t it? I've watched these boats and the people living on them just seem to sit there enjoying life day in and day out. I could do that. Maybe once in a while I’d actually get off my rump and go to a museum or out to dinner. I think I’d like it. So. First I’d have to get to Paris. (Note to self: work a bit longer). Then, of course, I’d have to get a boat. Let’s see….a few bedrooms (our friends will want to visit), a studio, two bathrooms, and a kitchen if there’s room….or is it called a galley? Doesn’t matter. We wouldn’t use it much whatever it’s called. Then, I guess I’d need a place to park it. Right beside Notre Dame would be handy. Or under the Eiffel. There never seems to be wall to wall boats in that area so I guess that wouldn’t be a big deal. What else? Oh….maybe we’d need to hire someone who actually has been on a boat and knows how they work. (Although I don’t plan on using it for travel – I get motion sickness). Forget all that. I just got the news – Charles Aznavour is coming to Montreal in April so the boat thingy will have to wait. How can I concentrate on boats with this sort of news in my head! Eeeeeeee! BTW – I don’t want to take all the credit here, but I did leave a message on Aznavour’s Facebook page asking him to come back to Montreal. I’m just saying. It sounds great to me. But then again, I already live on a boat every weekend (during the warm weather) - just not in Paris. A boat AND Paris sounds perfect! You're lucky. At least you can pretend you're on the Seine in summer :) Right now, I'm ready for spring.